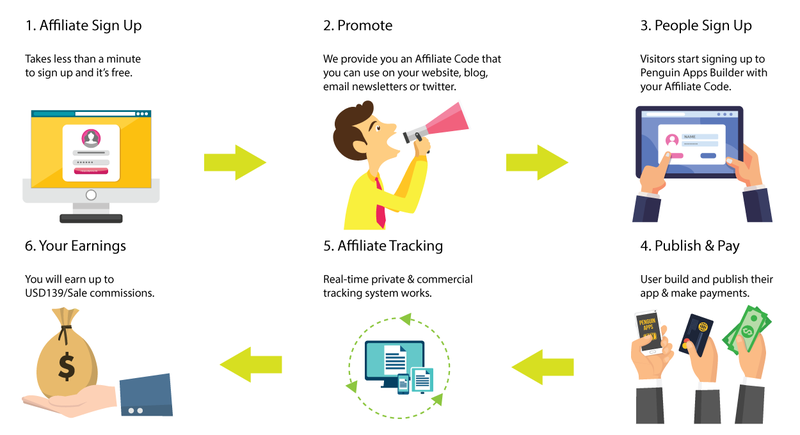 When you join the Penguin Apps Builder Affiliate Program you will get a unique Affiliate Code that you can share through a blog post, Facebook post, or even a tweet. Actually, you can share it in any way you like. Then you will earn income for every customer that purchases our subscriptions through your referral. Earn extra income by partnering with Penguin Apps Builder - Malaysia Pioneer Mobile App Builder Platform! Penguin Apps Builder offers you an easy way to monetize your website and apps through its affiliate program by a revenue-sharing model with up to 20% commission from each generated order. Having the most advanced technology with an easy payment cycle, and the best support team assisting you to make the Penguin Apps Builder Affiliate Program the best in the industry. Registration is FREE and EASY. Start earning with us now! Why Penguin Apps Builder Affiliate Program? How Penguin Apps Builder Affiliate Program Works?